Water from sewer system backups is considered Black Water. Sewage is a biohazard, is grossly unsanitary, and may contain bacteria and viruses that can cause illness. 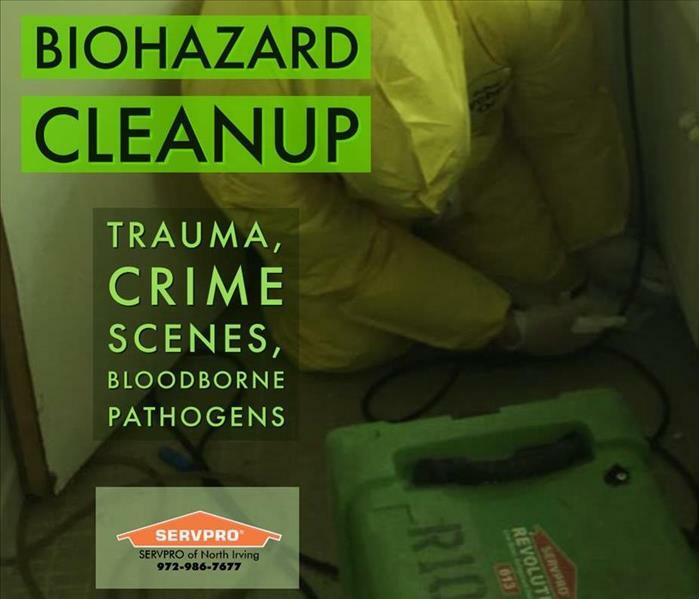 Special training and equipment are necessary to safely clean this type of biohazard. If your water damage is from a toilet overflowing with sewage, we will properly restore your property to a safe condition. After the sewage cleanup is finished, we will focus on odor removal to ensure you’re comfortable in that space again. SERVPRO of North Irving is a trusted leader in the fire or water emergency restoration industry. We are also an experienced and professional cleaning company. As a locally owned and operated business, we service all of Dallas Fort Worth. Our services include both home cleaning and commercial cleaning every day of the year. There are three major types of contaminated water. SERVPRO of North Irving will inspect that contaminated water to determine the type of water and then plan the appropriate response to safely restore your home or business.